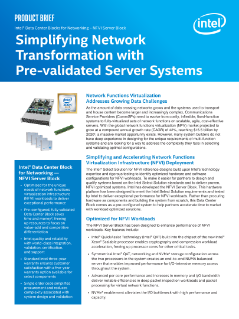 As the amount of data crossing networks grows and the systems used to transport and house content become larger and increasingly complex, Communications Service Providers (CommSPs) need to evolve from costly, inflexible, fixed-function systems to fully-virtualized sets of network functions on scalable, agile, cost-effective... servers. With the global network functions virtualization (NFV) market projected to grow, a massive market opportunity exists. However, many system builders do not have deep experience in designing for the unique requirements of multi-function systems and are looking for a way to address the complexity they face in selecting and validating optimal configurations.